A comprehensive custom Lentiviral-based Stable Cell Line Generation Service for genetically engineering sensitive cells, primary cells, stem cells and terminally differentiated cells. Lentivirus-based stable cell line generation offers a cost-effective and efficient alternative for generating stable cell line models for gene overexpression, inducible gene expression, gene knockout and gene knockdown. Modified lentiviruses with broad tropism to target most mammalian species and cell types. Non-integrating lentiviruses for CRISPR-lenti gene knockout. Choice of selection markers: antibiotic resistance or GFP for FACS. Use 3rd generation lentiviral systems for the highest biosafety standards. Gene editing confirmed by NGS or RT-PCR. With the FDA approval of two novel cell-based therapies for treating cancer, Kymriah™ and Yescarta™, the race for immunotherapies for different types of cancer and immune system-based disorders has intensified. Chimeric Antigen Receptor (CAR)-T is predominantly used in immuno-oncology and is a revolutionary adoptive cell transfer (ACT) therapy that uses genetically engineered, autologous T cell to recognize and kill tumor-specific antigens on cancer cells with a high success rate. CARs and other immunotherapies rely on genome modifications in primary T cells and immune cells. However, these cells are inherently difficult to transfect and show low modification efficiency. Applied StemCell’s lentiviral transduction of your targeting vectors offers a more efficient alternative to genetically engineering immune cells. Figure. Human primary T cells were infected with lentivirus encoding a mouse gene. Both non-transduced and transduced T cells stained with antibodies against CD3 (a T cell marker) and mouse gene. 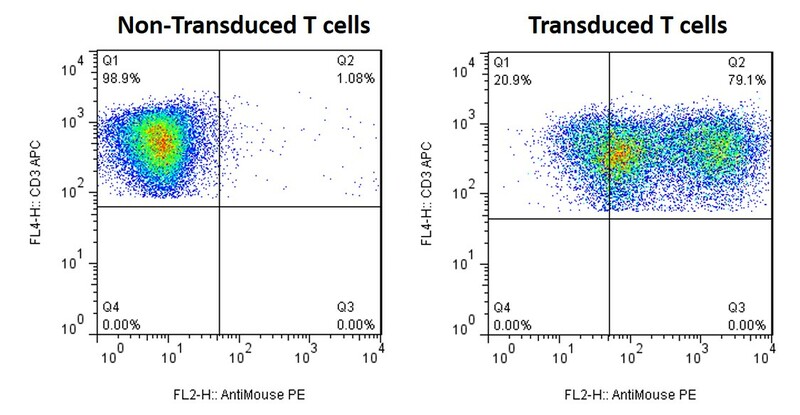 FACS analysis demonstrates that transduction efficiency of T cells is up to 80%. Can you genetically engineer stable primacy cell lines? Yes, it is possible to engineer stable cell lines in primary cells. However, primary cells have passaging limitations, and we can do the passaging as part of the process, and report it with the final (modified) transduced cells. We can also immortalize cells to address this concern. Each project will be considered on a case-by-case basis depending on the details of the specific cell line of interest. What are the types of cell lines that you can genetically modify? We can genetically modify HeLa, HEK, iPSCs, and primary cells to generate stable cell lines. Please inquire for other cell lines you do not see on this list. We offer non-integrating lentiviruses (IDLVs) for CRISPR-lenti gene knockout or knock down. We offer 3rd generation lentiviral system for stable gene knock-in into multiple cell types from most mammalian species. Applications include drug screening, functional assays, FACS screening of membrane proteins, long-term protein expression studies, antibody immunization boosting and gene therapy research. For further details, please refer to the FAQ section of this page. As well, please fill out our lentiviral stable cell line generation service requisition form and our cell biology experts will contact you to answer all your questions and design the best strategy for your specific genetic research and drug discovery needs.